People don’t want to listen to their thoughts, so they fill the world with noise. In my ongoing quest to read all the Newbery Award Winners, I decided to read the most recent addition to the list. 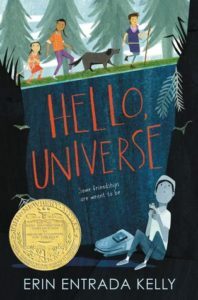 Hello, Universe won the Newbery Award in 2018, and boy am I under the impression that 2017 was a bad year for children’s books. It’s not a bad book, per se, it’s just not great in the way I’ve come to expect Newbery winners to be. It was a very fast read, even for a children’s novel, and it contained about a short story’s worth of plot. This also fills in my Award Winner Bingo slot. So Virgil Salinas is a very shy boy who wants to ask out Valencia Somerset, a girl in his class. A girl who is deaf, which is a fact that somehow escaped Virgil’s notice because even though he has a major crush on this girl he doesn’t really pay any attention to her. It’s one of the flaws of the book that’s never really pointed out and ugh, I am so over boys deciding that their crushes have merit when they don’t know the girl they have a crush on. Right anyway, Virgil enlists the aid of his ‘psychic’ friend Kaori Tanaka (and honestly she was the best character in the book and I would have read a whole book about her and her sister having crazy adventures because ‘the universe’ told her something needed to happen). However on a trip to discuss this with Kaori, Virgil runs into the bully Chet Bullens and ends up in quite a bit of danger. These four characters briefly interact over the course of one afternoon as they go looking for the missing Virgil, and Virgil himself finds courage as he deals with his situation. So that’s the plot, and there’s just not a lot there. I enjoyed the diverse characters, and found them to be lovely and fleshed out, but there’s not a lot of development. There’s not a lot of change, which makes sense because the book takes place over one day. Like I said, it’s fine, but that’s really it. I don’t feel the need to tell the children in my life that they HAVE to go out and read this book. (I’m not having much luck with the next Newbery on my list either though, and that one is from the 1920s, so clearly there’s an up and down scale here). Share the post "People don’t want to listen to their thoughts, so they fill the world with noise."